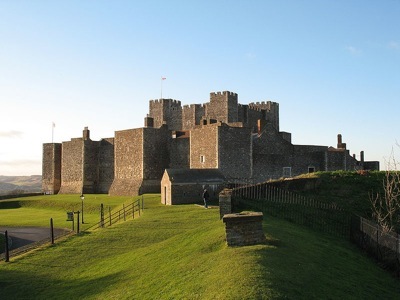 Dover Castle is an enormous castle facing the English Channel and France in Kent and it has been described as the “Key to England” due to its defensive significance throughout history. The statement is a little odd really because all of the invasions which have taken place over the years have happened at other places making this extremely big “Key to England” rather pointless. But then it was built by the Kings of England who were all French at the time and renovated now and again by the most recent mob i.e. the German Kings and Queens of England which might throw some light on the thinking behind this defensive relic! 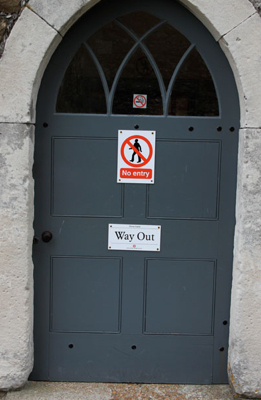 More recently following arms cuts and a general disbandment of the UK fighting forces the “Key to England” has taken on a bit of subterfuge as it defends England as noted on this door. Who says the British aren’t clever?